Sad, breaking news: actor Dom DeLuise, co-star of one of the greatest films ever made (Cannonball Run), just passed away at age 75. 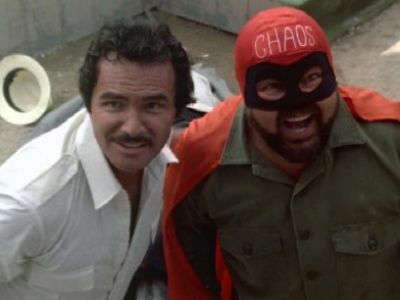 Often mistaken for chef Paul Prudhomme, DeLuise was Victor Prizim/Captain Chaos to Burt Reynolds' J.J. McClure in the classic 1981 flick. 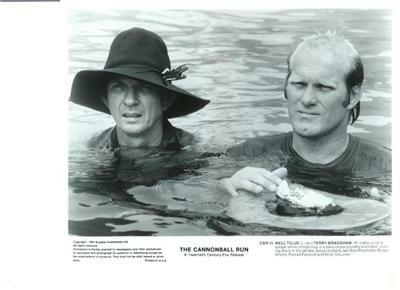 And in case you've forgotten, among the other huge co-stars in this film, such as Farrah Fawcett, Dean Martin, Sammy Davis Jr., Roger Moore, Jackie Chan, and Jamie Farr, was Pittsburgh's own Terry Bradshaw, in maybe the most memorable performance by an athlete in cinematic history. So there's your Pittsburgh sports angle for this post. Cannonball Run is one of those movies that simply does not get made anymore. A bunch of A-listers getting obviously plastered and having a great time doing their job is not the formula for films in 2009. In honor of Dom DeLuise, I highly advise you to check it out sometime soon. You will not, repeat, will not be disappointed. Another sign this movie would never be made today: Jimmy the Greek was a co-star. Who would today's equivalent be? Hank Greenberg?